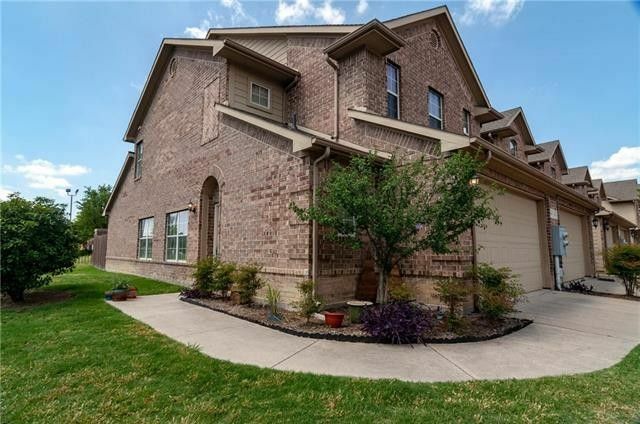 Incredible luxury end-unit townhome in gated community with awesome access to I-35 and 121. Awesome floor plan with Master bedroom and second bedroom up with two full baths and living-loft area. Downstairs study-den has doors and closet so could be used as third bedroom-flex room as well. Downstairs powder bath. Beautiful engineered hardwoods as well as carpet and ceramic tile, wet bar, granite counter tops in kitchen and baths. Large grassy area next to unit which is located in a cul de sac. Fenced backyard with patio ready for outside barbecues or a nice area for your pet. Don't miss out on this gem!! Very nice!